Named after a synthetic lawn, astroturfing is the creation of bogus community groups or independent authorities who endorse industry practice, recruit lesser-informed citizens, confuse the debate and make the real community groups appear extreme. Copyright: Copyright © 2006 Katherine Wilson. The published version is reproduced with the permission of the publisher. "A version of this article was first commissioned by an Australian broadsheet newspaper and then killed. Those wishing to obtain an electronic recording of the Ross Irvine workshop held in April 2005 can email requests to: <wilson.kath(at)optusnet.com.au>." There's a man in Canada who thinks I'm a terrorist. He was in Australia this time last year, presenting workshops around the country. They were titled, 'The best strategies to win against activists'. On his ad he called himself "Controversial Canadian PR consultant Ross Irvine". But a text scan of media around the world revealed no controversy surrounding any bloke named Ross Irvine. Not until he arrived in Australia, where The West Australian dubbed him "Rambo Ross" and ABC Melbourne's Jon Faine called him "the anti-activist-activist". Still, I booked into Irvine's Melbourne workshop. Held in a plush seminar room at a city business school, it cost A$595 for four hours, payable to the Public Relations Institute of Australia (PRIA). In this workshop, I'd learn how to create bogus community groups, false statistics, and links with "far-right-wing nutso activists". I'd learn to conflate "activist" with "terrorist" and "security threat". Controversial or not, Irvine had pulling power. Filing in to see him was a Who's Who of powerful industry and government flacks. David Gazard was there. He's adviser to the Federal Treasurer. Special Minister of State, Eric Abetz's adviser was there, too. And PRs from Rio Tinto, Shell, Dow Chemical, Avcare, the Victorian Farmers' Federation, Department of Primary Industries, Bayer, GrainCorp, Dairy Australia, Nufarm (distributes Monsanto herbicides) and Orica (industrial explosives). There was Clayton Ford, a cheerful chap in a fluorescent tie from Diageo, parent of big-brand liquors. Why was he there? "There are teetotalers," Ford explained. "And objections to marketing alcohol to teenagers." There was Tattersall's (gambling objection issues), the Port of Melbourne Corporation (channel-deepening issues) and people from PACIA (Plastics and Chemicals Industries Association). There were Socom staff, PRs for the insurance and building industries and local councils. And there was a young City of Darebin (local council) PR named Shannon Walker. "Development objections," he explained. "Tram stop advertising. That kind of thing." Finally, there was Don D'Cruz from the Institute of Public Affairs (IPA), wearing a gold tie-clasp and a stout suit, and smelling of cigarettes. Funded by many companies there, as well as federal government grants, his organisation lobbies against activities of non-profit bodies including the ABC and charitable NGOs (non-government organisations). We'd all gathered to hear a man who claims that proportional representation is "a bizarre thing" and that "corporate responsibility is a weakness. Corporate responsibility is letting someone else set the agenda." We'd learn that sustainability is "an extremist position", that science's 'precautionary principal' is "extreme", and that maintaining biodiversity "turns back the evolutionary clock millions of years and eliminates humans from the face of the Earth! That's extreme!" Animal protection bodies, we'd learn, really want to "sever all contact between humans and animals!" Dealing in absolutes (health advocates are in fact 'immoral!' Conservationists are really 'anticapitalist! '), when it comes to convictions, Irvine's a relativist. Challenged earlier that day on ABC Radio, he admitted, "There's a little bit of hyperbole in some of this. There's also a bit of fun." You'd hope so for $595. By the time we'd registered and eaten our roasted eggplant pides, it was clear most of us knew each other. There were twenty-nine of us here, and too many Daves. As well as those from the Coalition camp, there was David Hawkins from the PRIA, a bouncy man who introduced Ross Irvine. Irvine's trip, he told the group, was funded by the IPA (the industry lobby group) and PACIA (the plastics and chemicals body). Irvine's background, we learned, was as a PR adviser for the biotech (GM) crop industry. "Public Relations is war," Irvine announced, in his curly-r accent. He was wearing an elegant suit coat, a white shirt, and colourful tie. Trim, 50s, clean-shaven, with steel-rimmed spectacles and a pleasant, broad face, he flashed a boyish smile. "Don't be afraid to attack," he warned. "If you learn nothing else today, this is the message: 'Fight networks with networks'." Activist networks, he said, include supporters of NGOs like Community Aid Abroad, the Conservation Foundation, consumer groups, organic farmers, health advocates, Greenpeace, church groups and 'civil society groups'. These groups demand transparency, accountability, democracy and disclosure from business. "If NGOs demand transparency," he asked, lapsing into a whisper, "should NGOs be transparent too?" People were nodding. 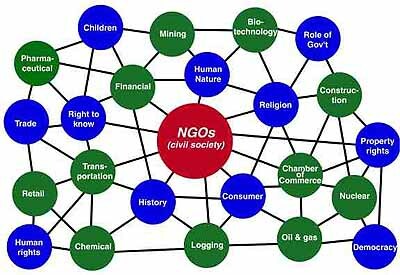 "Yet NGOs are largely unknown entities. And it's fair for business to demand transparency from NGOs." He repeated this many times, adding, "It's only fair. It's only balanced." But then we learned that detailed NGO records are available for industry PRs to gather intelligence. "There's a lot of information they have to file," he said, projecting their strategies - available online - overhead. "Here are their salaries, here are their tax receipts, marketing, lobbying, that sort of thing . . . their board of governance." And then he shot us a conspiratorial sideways glance. "You might find," he said, "that this person on this NGO board - might be on the board of another organisation!" To help us combat NGOs, Irvine referred us to the teachings of the Rand Corporation, a US national security think-tank. This was when 'activist' became confused with "terrorist", "criminal", "guerilla" and "security threat". Don't be fooled, he warned, when activists claim they're about third world hunger or the environment or public health. "If you're in business and you support biodiversity," he said, "beware of what you're really supporting . . . look beyond their immediate intentions. Their goal is a much larger concept that business, media and politicians must address!" Some of us questioned Irvine's generalisations. Why see activists as the 'enemy' (a word used many times today)? Can't industry engage with moderate activists? Some people agreed, others shook their heads. No, warned Irvine. Once you cave to one demand, they'll come up with "a whole bunch" of others. Which will eventually threaten capitalism itself. "You will really screw yourself in the end." A mess of complaints followed. Legal threats aren't working against activists - look what happened to McDonald's. Tanya Pittard, from the Victorian Farmers' Federation, said that even when industry and government are victorious, activists have 'won' by forcing them to spend money. The Grand Prix organisers, she said, had to deal with Albert Park residents and "crazy little old ladies", spending "thousands of dollars combating their crap". Irvine said that in Ontario activists are winning also. "You can't smoke anywhere now . . . 'Public health' is becoming a banner to implement a lot of restrictions on people these days, like foods in the dispensers in schools. It's becoming a banner to do all sorts of things . . . things I personally find questionable." It was starting to feel like therapy. The moustachioed PACIA man shared his issues with the group: "An activist group can go outside the private house of a CEO of a chemical company, roll up there and say, 'you're a baby-killer'. But if the same chemical company paid their workers to go outside the house of green activists and say, ah, 'you're a gay lesbian who does naughty things to whales', ah - we couldn't do that." The City of Darebin's Communications Officer, Shannon Walker, corrected him. "'Gay lesbian' is a tautology," he said. To combat the problem of activist letters in newspapers, Irvine urged PR folk to engage more people to write letters. "If there are three letters in there in one week saying, 'GM [foods] are good', the politicians think, 'hey, that's pretty neat'." Costello's people, sitting up the back, said nothing. They looked bored. It's hard for companies, said Irvine, because activists recruit people like "climate-warming, tree-hugging, salmon-loving, gay-woman-loving maybe" geneticist Dr David Suzuki. (Suzuki has said, "Any politician or scientist who assures you that GM products are safe is either very stupid or lying.") What would Dr Suzuki know, asked Irvine - Suzuki studied fruit flies! A PR for the GM crop industry, Irvine told us that millions of people have consumed GM products for years "without a sniffle!". There are in fact many documented cases of the adverse effects of consuming GM products. The most recent is the CSIRO pea case in Australia, and the most serious is the Eosinophilia-Myalgia Syndrome (EMS) case, in which around 5000 people across North America experienced a previously unknown disease, causing lifetime paralysis and fifty deaths. Showa Denko conceded a GM component of its product was responsible, and paid $1.2 billion in compensation. But agribusiness and biotech spin doctors were nodding. Activists have time and resources to do things that corporates don't, said one. Irvine agreed. "The smaller groups often get a tremendous amount of power and influence that they don't deserve . . . Quite frankly, business doesn't have the resources and capability that activists do." Liza McDonald, Stakeholder Relations Manager for the Port of Melbourne Corporation, didn't agree. "You're presuming all activists are wrong. Sometimes they're not." Her frustrations, she said, stemmed from the Corporation spending $12 million on an environmental impact statement, "and we didn't get the result that we wanted". Referring to the Corporation's contentious plans to undertake 'test' dredging, she said that unless you go ahead and channel-deepen, "you can't demonstrate entirely that nothing will go wrong". To a complaint that chemical companies are legally obliged to consult with community, Irvine said: "This is a process that activists have put in place over years! What they've gradually done to the State!" "What Ross is saying," added Hawkins, "is that we need to be activists too, expand our networks to actually change the legislation." Quoting Margaret Thatcher, George W. Bush, Fox News, Rand and the IPA, Irvine warned participants of "a very anti-business ethic going through society, I think it's going through the school system a whole bunch, too. I find that a little bit frightening, I think it's at the university level . . . boy, this sounds pretty bizarre and paranoid but I think there's a left-wing sort of thing." This claim, hammered daily in newspapers around Australia, can be traced to IPA campaigns and those of US neocon think-tanks. "The wild claims of far-right groups like the IPA drag the spectrum of political debate to the right," says Monash University economist Tim Thornton. "What was once a moderate position is now depicted as ultra leftist, while extremist propaganda seems reasonable, particularly when it's dressed up as fact." Referring to the ideology behind the Draft Charities Bill, imported wholesale from the US, he says: "Once these ideas were at the edge of sanity, now they're at the edge of policy." At the end of Irvine's seminar, we split into groups for exercises. One was challenged to "assume the position of moral leadership", a lesson from Irvine's work with the biotech (GM crop) industry. When the GM crop industry faced health, environmental, economic, legal and social challenges, it mounted a higher moral ground campaign: GM crops will save third world children from malnutrition and starvation. The stratagem is to promote not with facts, said Irvine, but values. This, he claimed, is what activists do, and what industry must do better. "There are some real immoral people on the anti-biotech side," he said. "Activists say, 'let the kids starve'. That, to me, is totally immoral and amoral and everything. That, I'm sorry, that just brings out, I get really . . ." he inhaled and shook his head. Another group was charged with finding ways to discredit activists. "Discredit the ideology and defeat the terrorist," advised Irvine. The group came up with: "Call them suicide bombers . . . make them all look like terrorists . . . tree-hugging, dope-smoking, bloody university graduate, anti-progress . . ." and "Spot the flake. Find someone who would represent the enemy but clearly doesn't know what the issue is . . . find a 16-year-old" and "distract the activist with side issues . . . and make enemies within the enemy camp so they spend all their time fighting and that helps to deepen their disorganisation." Our group was charged with 'empowering others' to support a cause. The cause was the Port of Melbourne channel-deepening. Once we had determined who we will 'empower' (unions, farmers' groups, retailers), the PRIA's David Hawkins suggested marginalising the environmental argument. This could be done with what Bush flacks call 'the fire hose method' - bombarding the media with issues, information and press conferences so they don't have the resources to interview alternative sources. To the suggestion that the case for channel-deepening should be the voice of reason, Hawkins replied, "No, no, let's be the voice of unreason. Let's call them fruitcakes. Let's call them nut - nutters. You know, let's say they're . . ."
"Environmental radicals," suggested Darebin's Shannon Walker. "Exactly. You know . . . say they represent 0.1 per cent but they dominate, you know, let's absolutely go for them." Our group discussed astroturfing. Named after a synthetic lawn, astroturfing is the creation of bogus community groups or independent authorities who endorse industry practice, recruit lesser-informed citizens, confuse the debate and make the real community groups appear extreme. The Guardian uncovered one case in which one of Monsanto's public relations companies, Bivings Woodell, fabricated science 'experts' and online 'scientific communities' who successfully discredited genuine peer-reviewed science reports about the dangers of GM crops. Protest movements were also invented, including one at Johannesburg's World Summit on Sustainable Development, widely reported as a demonstration by 'third world' farmers chanting "I don't need white NGOs to speak for me". The University of Wollongong's Professor Sharon Beder says 'astroturf' of this kind is rapidly propagating in Australia. "You need to know any particular issue very well to be able to distinguish the astroturf from the genuine grassroots groups," she says. "For example, in mental health there are several front groups funded by pharmaceutical companies but they have a great deal of public credibility. Unless you know the issue well, you wouldn't be able to pick them." Those alleged by academics to be front groups include the Forest Protection Society (funded by the logging industry), Green Fleet, the Institute of Public Affairs (IPA) and Mothers Against Pollution, which campaigns against milk bottles and is funded by the Association of Liquid Paperboard Carton Manufacturers. No, that's - you don't need the research at all . . . you say, '50 per cent of the workforce will go if this doesn't happen' . . . You just say 'we believe' - we don't know if it's true or not - but we say 'we believe' . . . if they say, 'can we have a look at your research?' then we just run. We don't answer, we just close down the website and open another. In our group was Bernadette Basell, senior partner of KPPR, which represents the mobile phone industry. She didn't share Hawkins' approach, saying later that "misrepresentation and deception, such as astroturfing, is deplored by most in the public relations industry. Community groups usually have genuine concerns that need to be addressed." I later learned that Basell then alerted Hawkins to the possible motivations behind my line of questioning. Later still, Hawkins sent me an email to clarify what he'd said at the workshop. "It is totally unacceptable and unethical for any PR practitioner to pretend to represent another organisation that they do not represent or to fabricate a community group or identity," he wrote. His public relations company, Socom, a firm with mostly Labor and some Liberal government clients across Australia, has set up community groups, but there's no evidence to suggest these are astroturf. It's acceptable, Hawkins wrote, for PR firms "to assist members of a community set up a group". Yet the PRIA (of which Hawkins is Victorian director) has been accused on Crikey.com of being "a secretive organisation" with "questionable" political links. "The Institute purports to be a professional body," wrote one practitioner. "They are ill-equipped for the task. Individual members are themselves open to claims of dubious ethical behaviour." Shannon Walker summed up the PRIA workshop as "weird", saying he didn't learn anything he could use. Hawkins said "If Ross was to return to Australia I would definitely consider running another workshop". Asked why he partook in the workshop, Costello's adviser, David Gazard, declined to comment. But government employees - be they federal or local - have no place in a forum that promotes ways to stop citizens participating in the democratic process, says economist Clive Hamilton. Hamilton heads the Australia Institute, a public policy research body funded by grants from philanthropic trusts and staffed by economists. (The Institute claims to be neither left nor right wing.) Given an audio recording of the workshop, Hamilton responded, "Why a government agency would attend a seminar like this is beyond comprehension. These agencies are owned by the public, yet by attending seminars to learn how to beat citizens' groups by means fair or foul they are turning on their owners. Only an organisation that has wholly alienated itself from the public would even consider attending an event like this." Not all at the workshop agreed with Irvine's methods (the Port of Melbourne Corporation's Liza McDonald said later, "It would be a very terrible world if there weren't activists".) But the Australia Institute's survey of 290 NGOs suggests the PRIA event is part of a wider campaign to silence dissent. Seventy-four per cent of NGO respondents believe they are being pressured to make their public statements conform with government policy. Ninety-two per cent said they disagree with the view that dissenting voices are valued by government as part of a robust democracy. Ninety per cent believe that dissenting organisations risk having their funding cut. "You toe the line or you risk getting defunded," one respondent said. Another said: "It is clear from our funding contract with Government that it sees our role not as a peak body in a democratic society but as a mechanism to help the Government 'get its message out' and help the Government implement its policy objectives." This comes at a time when the federal government has slashed funds to larger NGOs but boosted funding for its own advocacy, spending more money than any Australian government in history on public relations consultants. It is also a time when, depending on which statistics you believe, 30 to 90 per cent of news content is PR-driven. At the workshop wrap-up, Irvine handed out his business card, ink-jet printed on flimsy stock, with a pedestrian logo - '?' over 'NGO'. He's 'President' of ePublic Relations, a corporation with online marketing and 'net-wars' expertise, but its website design is amateur, with links that don't work. Asked how to get around spamming laws, he has no idea. And ePublic Relations' address in Guelph, Ontario, is a modest house in a suburban street, with, according to one source, "no indication of business activities". Some advocacy groups suggest that Irvine is SuperAstroturf, imported by industry front groups to seed a lawn of propaganda. "For some time right-wing think-tanks have been developing a campaign to discredit and undermine the work of NGOs," says Hamilton. "The attack on their role in the democratic process is being taken up by conservative governments. The Howard Government is playing footsies with the IPA, which itself is associated with the far right in the USA." The IPA's campaign to strip charitable NGOs of their tax exemption status if they engage in advocacy (or 'activism') is the essence of both Irvine's workshop and the Draft Charities Bill. The Howard Government paid the IPA $46,000 to develop 'advice' for this Bill because, it claims, NGOs have too much influence on government. paranoid nonsense, an ideological obsession that sits badly with basic reasoning and observation. The evidence reveals that humanitarian and environment groups enjoy wide support among the electorate, but they actually have little influence on policy compared with business lobbies. Yet they have to be at least as accountable as these lobbies. Clive Hamilton says the campaign to silence dissent and defund NGOs who criticise policy "would destroy many of them, and that's what John Howard and Peter Costello want. It's soup kitchens or nothing." A version of this article was first commissioned by an Australian broadsheet newspaper and then killed. Those wishing to obtain an electronic recording of the Ross Irvine workshop held in April 2005 can email requests to: <wilson.kath(at)optusnet.com.au>.